It's finally starting to warm up in Virginia, and while we are not in the clear to completely uncover our cannas and bananas, we can start to work on them now! Over the winter, the mulch placed over the plants to protect the roots from freezing has been packed down from snow and rain. It's very important to allow air to circulate through the mulch to prevent it from staying waterlogged and creating an environment for rot. 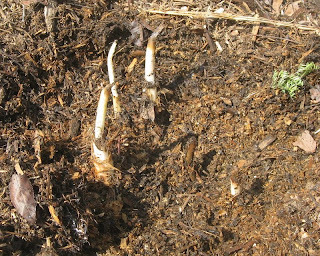 I use my hand to fluff the mulch and check for new growth and, if present, remove any slimy parts of stalks. As there is not likely to be a deep freeze for the remainder of the spring, I cover the plants with a little less mulch to maximize air circulation. Here's a pic of the banana plant I winterized last year before I covered it back up. You can see the new growth already starting, and there are two additional stalks! Wow, lucky you to be able to grow them outside! Mine are still sulking in the greenhouse. Any updates? Mine are starting to poke out of their mulch base. I'm thinking this weekend might finally be the right time to uncover, as well as plant up all my cannas that I purchased recently. Do you grow any palms? I love my Trachycarpus fortunei (Chinese windmill palm) and am receiving an order including a Butia capitata, another trachy, some Sabal minor, and some Rhapidophyllum hystrix this weekend from the Chilly Palm Co. out of York, SC. I can't wait! I am also trying to grow Musa sikkinensis, Sabal minor, and Trachycarpus fortunei from seed, but they won't be ready to plant out for a long while! I have not planted any palms, but they're on my list! What kind of growth rate have you got out of the windmill?